I remember learning the capitals of countries and states for a scholarship exam during my school days, and then Shillong was the capital of Assam. I liked the name ‘Shillong’; it had something musical to it. With my vivid imagination, I used to get lost in its beauty and the torrential rains of Cherrapunji. In 1972 when Meghalaya formed a separate state, I was captivated by this name too, it had an ethereal tone. 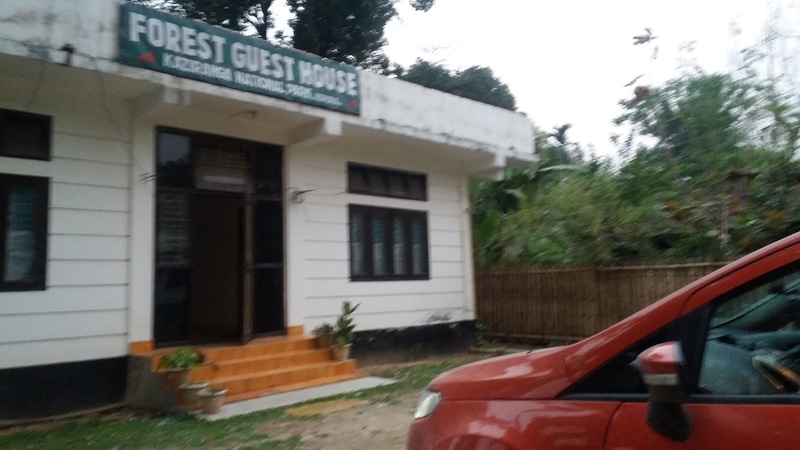 When we reached the forest guest house in Kaziranga after a strenuous journey from Bomdila (the roads were really bad and it took 3 hours to cover 80 kms), I felt like having reached home. We took some rest in the room and went out in the evening , had tea and took a look at the local shops. I found black rice which is used for making sweet interesting and bought a packet. We asked the girl in the shop to suggest a good place for the next day's lunch and she told us to go to Pelican dhaba. Then she asked us whether we would like to have some white tea. We told yes, really surprised at her generosity. 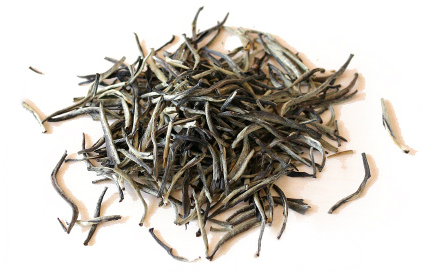 White tea is known to be one of the most delicate tea varieties because it is so minimally processed. It is harvested before the tea plant’s leaves open fully, when the young buds are still covered by fine white hairs, hence the name “white” tea. These buds and unfurled leaves from the newest growth on the tea plant are handpicked and then quickly and meticulously dried. The leaves are not allowed to oxidize as long as leaves plucked for green or black tea production. This minimal processing and low oxidation results in some of the most delicate and freshest tea available. Studies have linked white tea with many health benefits, like it reduces the risk of heart disease, combats skin aging and helps with weight loss. I have to admit that the white tea had a certain vibration in it while drinking. There was cultural show at 7 pm and we decided to see that. There were two dance shows, the first one was Bihu and the second was Zhumoir, which is folk dance of the tea tribe community. The local people were celebrating their Bihu festival. It is interesting how we get to see the local festival celebrations, even though we just plan our trips according to our convenience. The Bihu dance had body movements and hand gestures similar to Cambodian dance that we had witnessed during Cambodia visit. It was a real joy watching them perform with full involvement and joy. Zhumoir dance was performed by people who were working in the tea plantation during the day. What energy they exuded! When the performance was over, they came down the stage to the empty space in front of the audience and invited us to join them. I love dancing, so went ahead, along with my daughter and some others. The dancers were so happy that we picked up the footsteps and hand gestures. In both the dance performances, the dancers only were singing. As a dancer, I know how much energy is needed to do that. My heart filled with reverence for them. Next day morning elephant ride was fixed for us in the Kaziranga forest. I had misconceptions regarding this, because I thought it was cruel to the elephants. But my attitude changed after the ride. The animals are so well taken care of in Kaziranga, it was a joy to see the rapport between the care takers and the animals. We were three of us, plus the person taking us on one elephant. I think all of them were female elephants, and the baby elephants were also walking along. They were all having their breakfast on the way, uprooting and eating grass. Our mahout was very good in spotting birds and animals and we got to see rhinos, two types of deer, and many types of birds at close quarters. The energy around was so great that we were so refreshed by the time we completed the ride. Though only one day stay was planned at Kaziranga, we decided to stay for another day as the peace we felt there was beyond imagination. After the elephant ride we had breakfast and then rested in the room. For lunch we went to the Pelican dhaba and ordered Assamese thali for lunch. Oh my! What a delicious lunch it was. 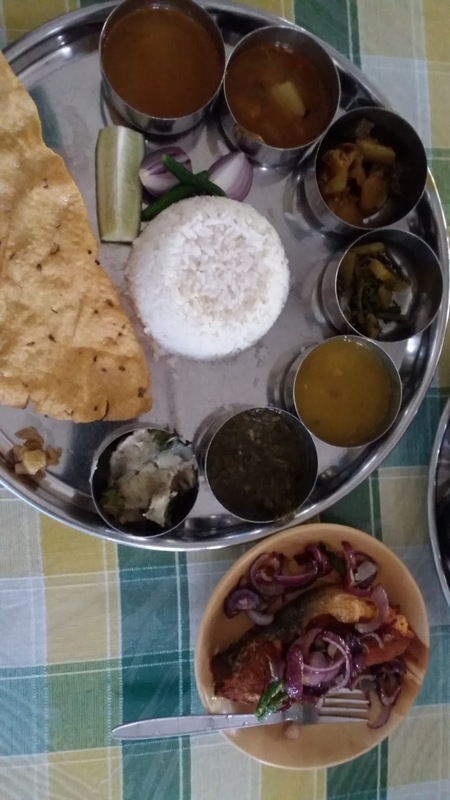 Each and every item was good and I was totally bowled over by their cuisine. 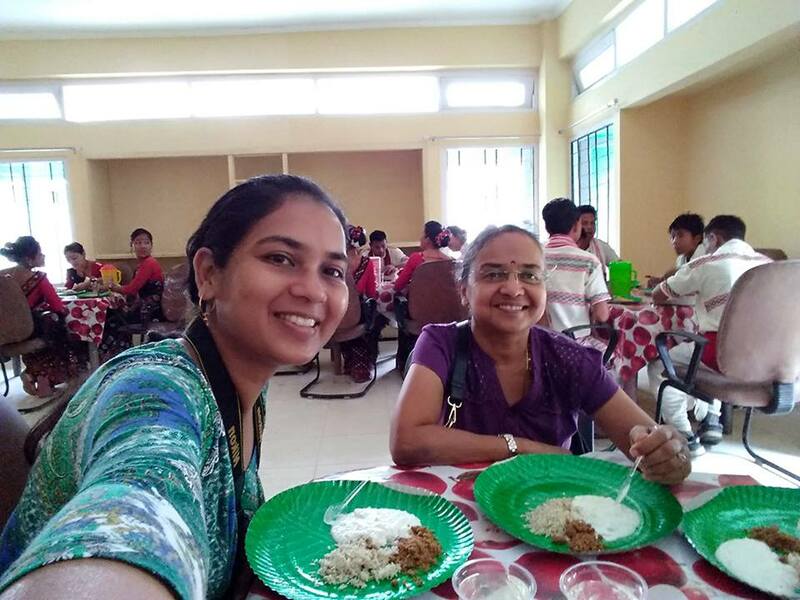 We were invited to join the Bihu celebrations by the employees of the Kaziranga forest department. It started at 2 pm and continued late into the evening. It was a joy to watch many performances by small kids, ladies and boys. They were all so happy and full of energy, totally enjoying what they were doing. In between they invited us to have light refreshments with them. We had some nice local preparations, and they were serving with so much love, forcing us to have more.